When it comes to sprinklers, it’s all in the timing. 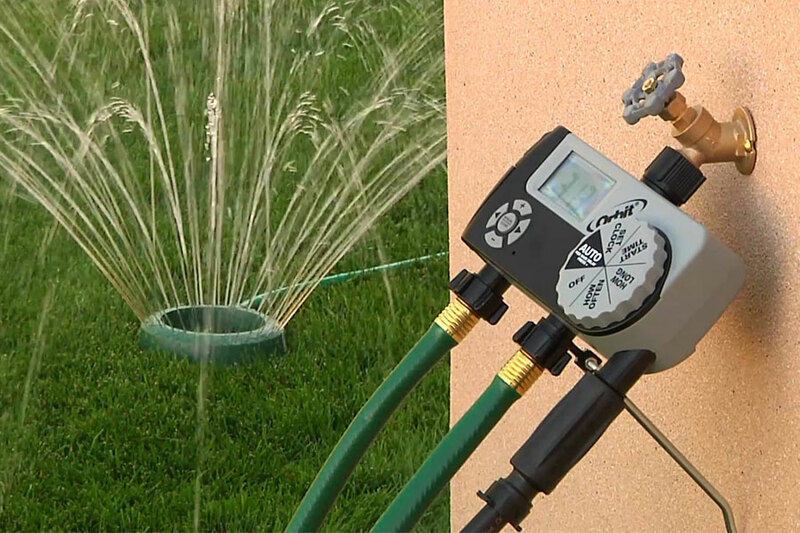 Finding the right sprinkler timer is a convenient way to choose when you water your lawn, and set everything just right for when you go out of town. When trying to decide on the right timer, it’s important to first ask yourself some questions. First of all, do you want your timer to be mounted indoors or outdoors? If your sprinkler system is broken into zones, then it will be important to find a timer that accommodates that many zones. Now, think about how many programs you need. Having multiple programs is important for when the seasons change, and you want to switch over to another pre-set schedule that is better adapted to the change in climate. Lastly, ask yourself how much you’d like to spend, and how easy you’d like the operation of the timer to be. There are some pretty expensive systems out there with wonderful features, but perhaps you don’t need all those features and are just looking for something simple and affordable. If someone were to predict 20 years ago that one day a sprinkler system would harness the power of the internet to predict the weather and therefore save water, no one would believe it. However, if you bring up this idea today, nobody bats an eye. 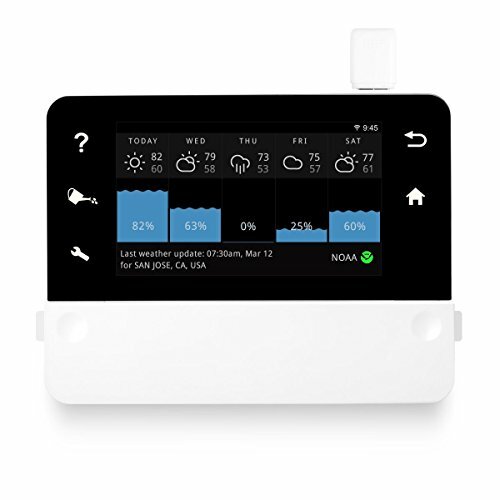 RainMachine has created a marvelous sprinkler timer that reads the weather forecast and waters your lawn accordingly. The system is so intuitive that you’re going to see your lawn and plants healthier than ever. Over-saturated shrubs become very ill, just as much as dry shrubs. That’s why this irrigation controller is so perfect for finding the perfect balance for your delicate little ecosystem in the yard. There are a number of programs in the system that you can use, and even customize individual days of the week. The system can recognize overlapping schedules and conflicting programs, and resolves these issues. This is not only great for your lawn, but fantastic for the environment as well. The RainMachine ensures that you never use more water than you need. If you’re someone who thinks that it’s impossible to relax and watch the television without a remote, then you should also be the person who thinks it is impossible to govern your sprinkler system without a remote. 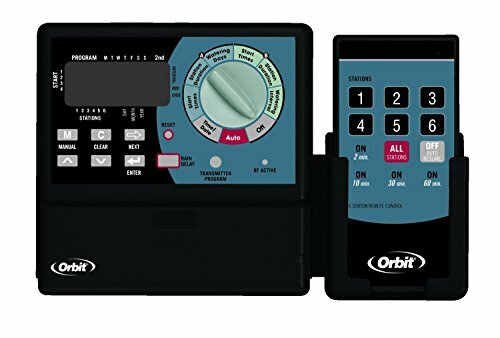 The Orbit Water master is the ultimate convenient way to program your sprinklers from the comfort of your home, or anywhere within 300 feet of your lawn. There are traditional water programs, as well as more advanced programs for fertilizing lawns, planting flowers, and water landscaping. Gone are the days when you were prisoner to the controller box. Now you have the freedom to get the programing just right from wherever you choose. It’s incredibly intuitive and easy to program, with a fine backlit display, and commands in a number of different languages. There’s also a built-in wireless receiver should you want to employ the optional rain sensor. This is a fantastic and simple device that makes your yard healthier and your life easier. Orbit makes programming your sprinklers a snap with their single-dial control system. 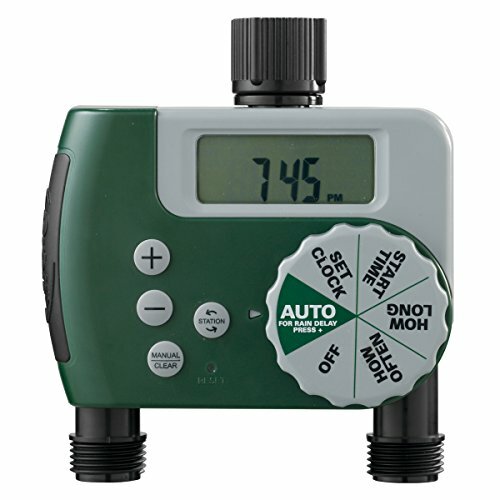 Perfect for newbies who have never set their sprinklers to a timer before, this timer makes it easy with the touch of a button to control when and for how long your sprinkler system will run. The durable, water resistant construction will keep this timer lasting for years, and will withstand the odd afternoon where you happen to get trapped on your lawn during a watering period. Rain delay and manual watering functions ensure that you’re never over-watering your lawn, and therefore not wasting precious resources. The whole package is backed by a wonderful 6 year limited warranty that gives you the freedom to give the system a try without any risk of your precious money going to waste. The system is incredibly affordable and easy to use, and will save you from ever having to deal with a soggy, over-watered lawn, as well as dead plants due to under-watering.